Herbal tea is a healthy and delicious drink that tastes even better when brewed from homegrown herbs. Grow herbs for tea in a small section of your garden, in containers on a sunny window sill or in a companion planting arrangement with fruits and vegetables. 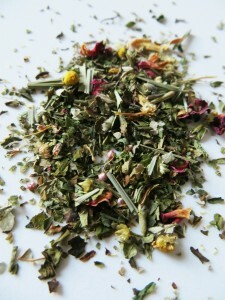 Adding medicinal herbs to homegrown tea blends can aid digestion, relaxation and boost immunity. Companion planting positions specific plants together to grow in a mutually beneficial partnership. The following herbs support their partner’s development and ward off pests during growth, and make great tea after harvest. Select containers with good drainage. Fill containers ¾ full with potting medium. Sprinkle herb seeds on top of soil. Pat down gently. Water initially. Continue to water as required to keep soil moist, not saturated. Herbs thrive in well-drained soil, moderate temperatures and 6 or more hours of light a day. Cut herbs when plants begin to form buds, with the exception of chamomile or calendula, whose flowers are utilized to make tea. Rinse herbs and shake away excess water. Blanching herbs before drying helps keep color, but is not critical to preserve herbs. Tie herbs in breathable bundles and hang to dry, or place in a dehydrator at 95 degrees Fahrenheit. Store dried herbs in airtight containers until use. Place 2 parts preserved mint and 1 part preserved lemon verbena in a clean quart-sized jar. Top jar with airtight lid. Brew tea with 1 Tbsp mint tea per 8 oz cup of hot water. 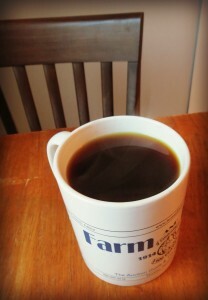 Steep for at least 1 minute before enjoying tea hot or allow tea to cool completely for refreshing iced tea. 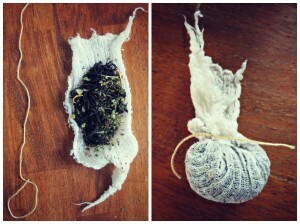 Make your own reusable tea bags with fine cheesecloth, muslin or coffee filters. Cut a small square of fabric. Place 1 Tbsp tea at center of cloth.